Find out how to define rights and accessibility of an owner, assign a property to an owner or delete one. Go to Menu and select Owners. Click on the owner's name or email address. A new window with the owner's account information will appear where you can manage his access rights to your system and assign/un-assign a property. 💡 Note: Each property can only be assigned to one owner. This owner can edit House Contact information If activated, the owner can edit the Property's contact information. At the same time, the property manager will not be able to edit the contact information anymore (below error message will appear for property manager). 💡 Note: This setting is only valid together with the access right to edit assigned properties. 💡 Note: Visibility of Guest name depends on a separate setting. 💡 Note: The owner can also create new bookings and closed periods. This owner can download Booking Report If activated, the owner can download a booking report for his property's reservations. This owner can sync the calendar via iCal If activated, the owner can access the Import/Export Tool in General Settings. This owner can manage Property settings If deactivated, the owner cannot create new Custom Features or create Promotions and Add-ons. He will only be able to assign an existing Custom Feature and edit Promotions and Add-ons. This owner can manage Rate policies If activated, the owner can create and edit Policies via the General Settings. 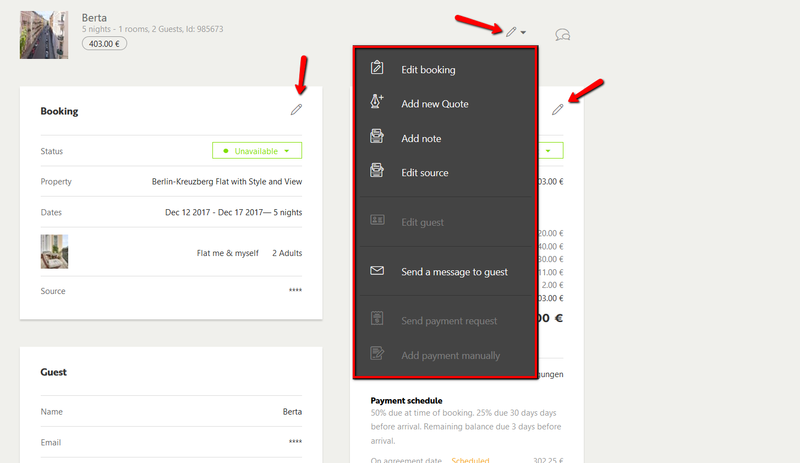 This owner can view the Source of the booking If activated, the owner can see from which source this booking came from, e.g. Airbnb, Booking.com etc. 💡 Note: To edit the property contact details, the rate policies, and to create new custom features or create add-ons and promotions he needs to have specific access via a separate setting.